Ten years ago, on January 30th, my life changed. It changed because a consultant uttered the words ‘you have Parkinson’s’. Just over six years ago, I started to write, because I had struggled – and continued to struggle – to make sense of my condition. I reckoned others might have the same problem, and I hoped that by sharing I might be able to help both them and myself. You can find reviews on Amazon and here. If you want to read it, I’d be honoured. It’s available both as an e-book and a real, paper book. 30% of royalties goes to fund research into Parkinson’s. You can also read pieces which deal, either directly or en passant, with my experience of living with Parkinson’s Disease. 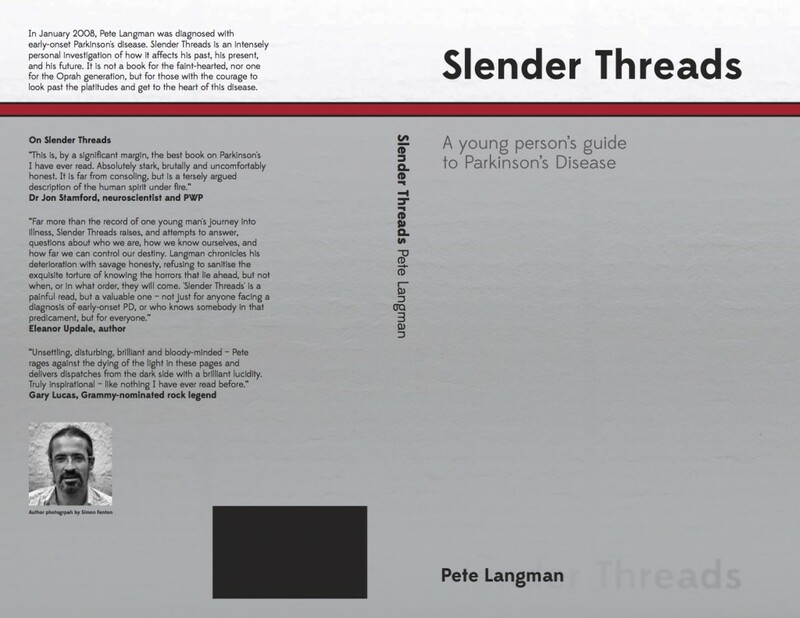 Slender Threads: the whys and the wherefores – on the reasons why I wrote my book. Care, not killing? Behave – on assisted suicide for those with non-terminal conditions. Spit or swallow? – on one of the lesser-known symptoms of PD, difficulty in swallowing. A day in bed – another mention of how rasagaline prevents the use of decongestants in the presence of a cold. I think, therefore I … ooh, what’s that shiny thing? – on old-fashioned OCD and one of the lesser-known side-effects of medication. hot lemon and hopelessness – This was written on the evening of the September 7, 2009, I think. The title stems from the rather obtuse fact (and oddly enough, one which I utterly fail to mention, which at this juncture confuses me somewhat) that the new drug I was prescribed prevents me from taking lemsip when I have a cold. Really. How utterly mundane is that? Wow, that is stunning the immer flashy and brilliant yet akward (for non students) mr Pete Langman, i’ve found you on the net and read this… wow the force is strong in this one wonderful, i put it in fav. and find my time to read about it, your goals and achievements and life after we seperated back in somewhere May ’95 when i gratuated from GIT London and became a teacher in the art of music and we both moved along. how you handle this as you handle the guitar is a great inspiration. All best in everyway, greetings your Dutch student Martijn.